We're celebrating our second birthday here at Elizabeth & Co.! 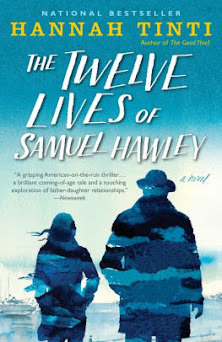 Two years, is that really possible? 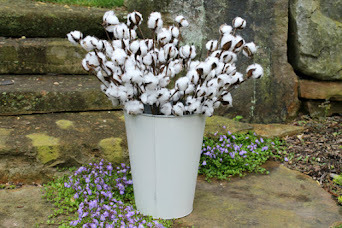 Watching your blog grow is a little like watching your children grow up - it all seems to happen in the blink of an eye! You start out having no idea what you are getting yourself into, but you pretty much just figure it out as you go and enjoy the ride. 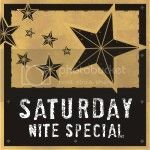 ..... And as always, the very best moments come from the connections you make along the way! ..... So a huge thank you to all the talented and generous people I have encountered along this journey. I am constantly motivated and inspired by you. I appreciate each and every visit, comment and all your words of encouagement. You have touched my heart in more ways than you can imagine! The blog actually started with me in the kitchen cooking and Megan at the kitchen table on the computer. 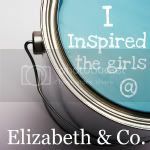 Documenting our journey here at Elizabeth & Co. sounded like a good idea, but I had no idea what that really meant. Next thing I knew, Megan had it all set up and was nudging me along. She's still nudging. Thank you to my very sweet girl! I don't write about it often, but I really love to cook. And believe me, my cooking skills are way better than my computer skills. I wish I could invite you all over for a party! Of course there would be cupcakes and ice cream. Since that's not possible, I am sharing two of my favorite recipes with you today! lemon zest is optional, but highly recommended! Preheat oven to 350 degrees. Beat first fve ingredients together in a large bowl with an electric mixer on low speed until blended. Beat 2 minutes on medium. Spoon into 18 paper lined cupcake tins. Bake until wooden toothpick inserted in the centers come out clean, about 22 minutes. Cool on wire rack. Beat the remaining ingredients on low until well blended to make a delicious (and not too sweet) cream cheese icing. Frost and enjoy! And if you love lemon as much as I do, you can add 1 tsp grated lemon zest into the frosting and garnish with additional zest. If you don't have a microplane zester, you don't know what you are missing! I first made these cupcakes for Megan's bridal shower a few year's ago. They are now a family favorite, especially in the summer! Now of course you're going to need some ice cream to go along with those cupcakes right? You will need a gallon size ice cream machine for this recipe. We received one as a wedding present and we have been making homemade ice cream ever since. We have tinkered with a whole lot of recipes, but I promise you that once you try this one, you will never be able to go back to grocery store ice cream again! In a large mixing bowl, beat eggs until foamy. Gradually add sugar and beat until disolved. Add whipping cream, vanilla and salt, mix thoroughly. Pour into can and add milk to fill line. Freeze according to the directions on your machine. Makes 1 gallon of the best vanilla ice cream ever! ..... But now that you have the basic recipe, you can have some fun and add your favorite flavors. Our Christmas Eve tradition is vanilla ice cream served with an assortment of hot syrups. But in the summer, add four cups of your favorite fresh fruit (very finely chopped) into the can with the ice cream mixture just before filling the remainder of the can with milk. ..... This is what it looks like when it is finished and you remove the lid! Yum, this batch is strawberry! When you hear the mixer stop running, you'll want to be there with a spoon ready to help clean the beater! Believe me, it's worth every single calorie! So there you have it, our virtual birthday party. Can't wait to see what the coming year has in store. The Union Jack craze has been going on for quite a while now. 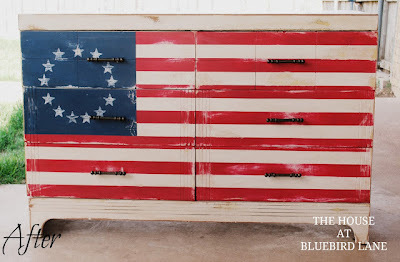 Sharla from The House At Bluebird Lane decided to go with a Betsy Ross inspired theme for her dresser makeover. I have a feeling we'll be seeing a new craze! 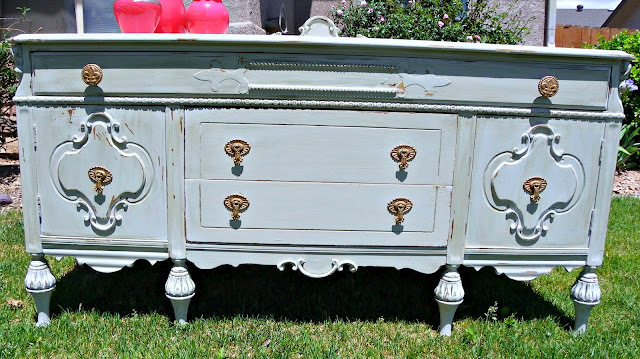 Saved By Suzy shared this big beautiful buffet with great details and gorgeous hardware. Simply stunning Suzy! 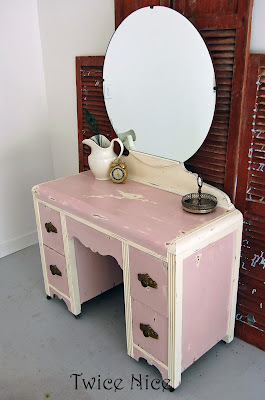 Deb from Twice Nice created this pretty in pink vanity for a charity auction. Love the color, the hardware, the mirror and the sweet hand painted little bird on a branch! 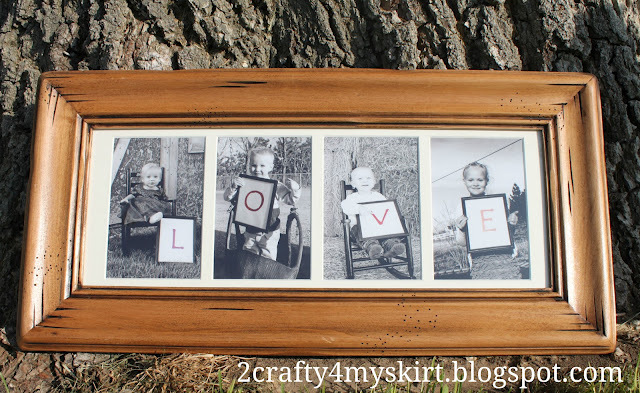 Now how seriously cute is this little transformation from Liz at Quirky Vistas? I think I need to search for some old faucets! Last week I featured the fabulous factory cart coffee table from The Blissful Bee. 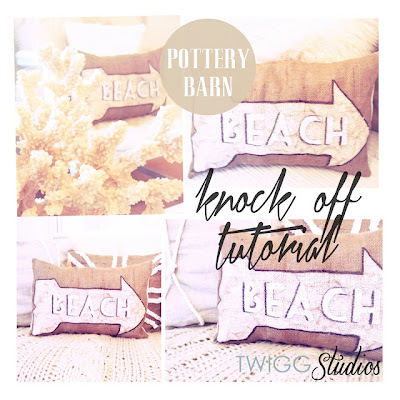 This week Amy shared a detailed tutorial on how to age wood. You'll definitely want to save this for future reference! 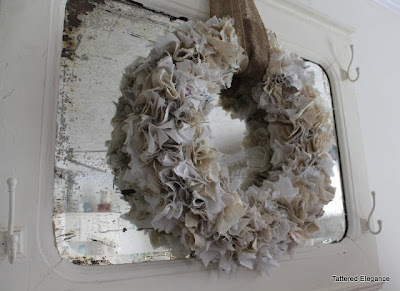 Love this Rag A Muffin Wreath from Erica at Tattered Elegance! Isn't it dreamy on that vintage mirror? 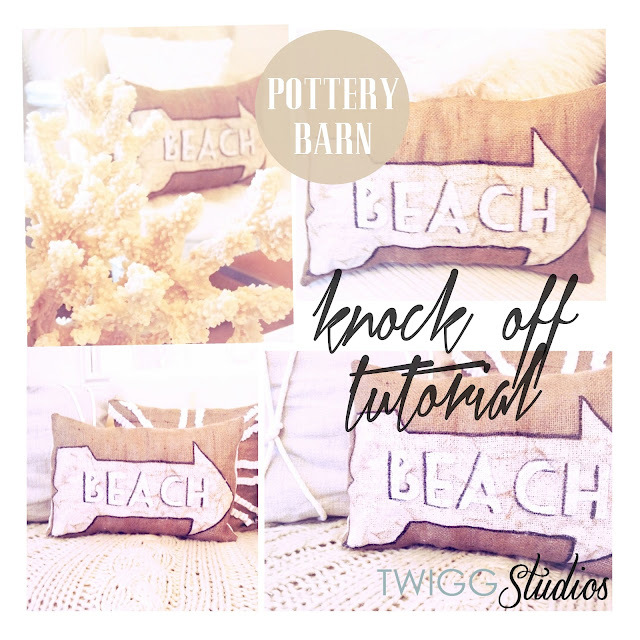 You can make a great beach pillow with this Pottery Barn inspired knock off tutorial from Aimee at Twigg Studios. 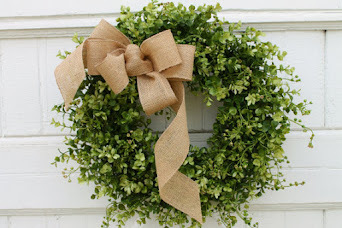 This veggie wreath from Linda at Coastal Charm is fun, fresh and just the way Linda likes it - thrifty! And to end on a sweet note, Fiona from Lilyfield Life shared this Chewy Chocolate Slice recipe complete with a challenge - bet you can't stop at just one piece! "What took me so long?" 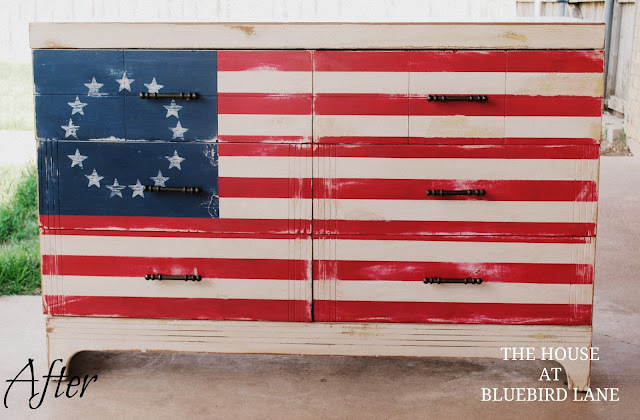 Susan brought this cool old door to one of our tag sales at least a year ago. It pretty much went straight from her car to my car. I don't think it even made it into the house. I knew immediately that it would make a great chalkboard. I even had a spot all picked out for it. But then it just kind of got buried in my garage. I loved the crusty brown paint and didn't want to completely cover that up. So I gave it a light sanding and just dry brushed it in a pretty shade of blue. Basically that meant just barely dipping the tip of the paint brush into the paint and brushing very lightly. The center panel got three coats of chalkboard paint. I sealed the blue with a coat of clear wax. And the chalkboard was seasoned by rubbing it all over with the side of a piece of chalk. Don't you love the arched top? And how about that knob and keyhole? It really doesn't get much easier than that! Seriously, I have no idea what took me so long! This one is going to hang out at our townhouse. At least I got it done well before football season! 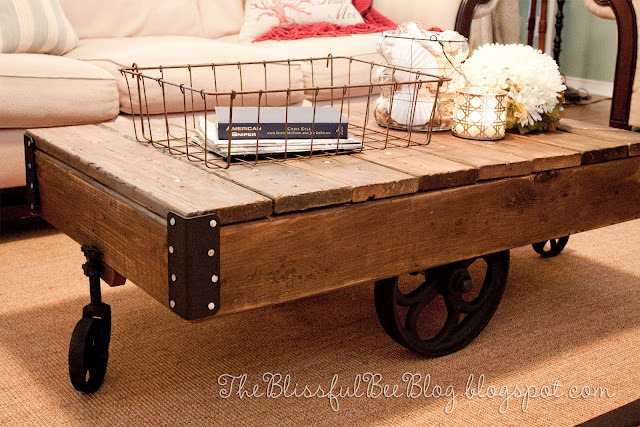 Amy from The Blissful Bee shared all the DIY details on this amazing Restoration Hardware inspired factory cart coffee table. I'm swooning over this beauty! 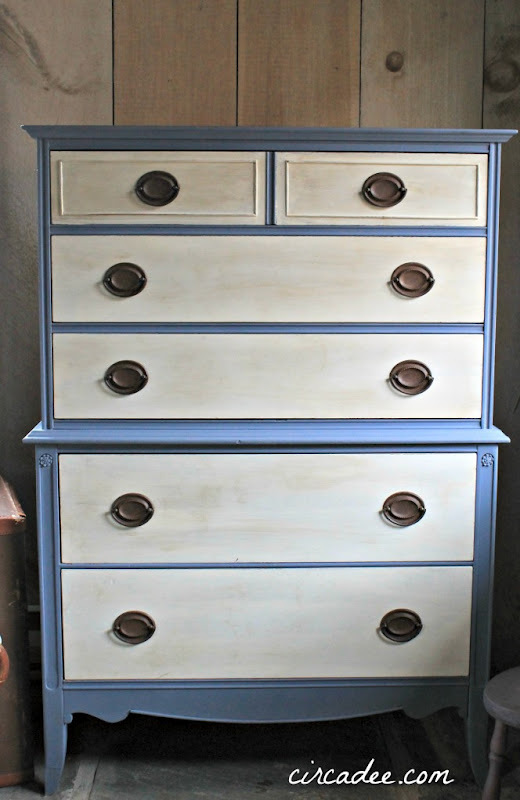 Dana from Circa Dee did a little two-timing on this beautiful chest of drawers. I love the curves along the bottom and the gorgeous hardware too! And Leone Design used three different colors to achieve a beautiful and sophisticated feel on this accent table. 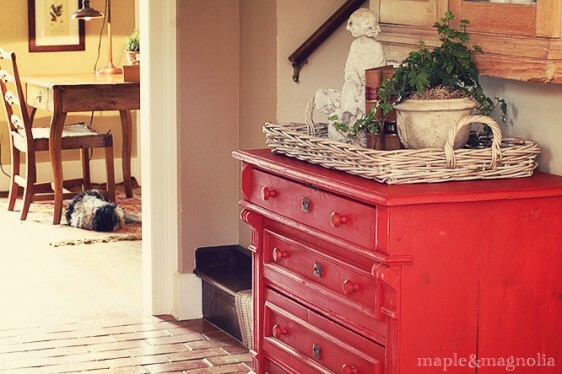 Susan from Maple And Magnolia wanted a fresh pop of color in her entryway. 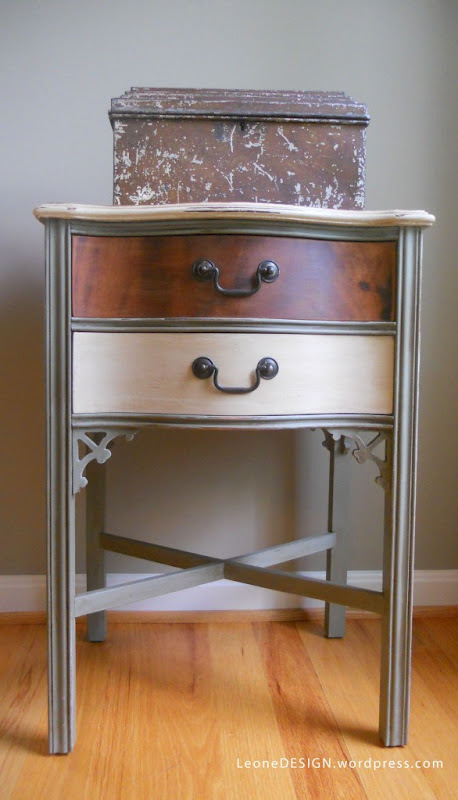 I'd say this beautiful antique pine chest fits the bill perfectly! 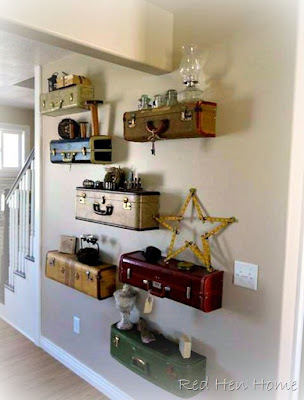 Korrie from Red Hen Home updated her suitcase wall for spring. It's so fun and whimsical! Doesn't it just make you smile? 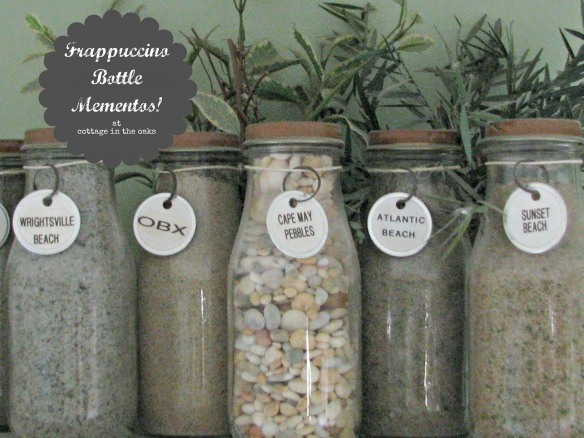 Duane from Cottage In The Oaks found a great way to reuse Frappuccino bottles to hold special mementos. I love the idea of a sand collection from favorite beaches! I can think of so many possibilities for the photo collage inspiration from Alese at 2 Crafty For My Skirt. Really sweet!